We've heard of Twitter wars and Facebook spats, but what about a company using its own site to wage a battle? To respond to Kanye West's claim that Zappos sells "sh-t products," the ecommerce site used its own platform to retaliate. Zappos is now offering an actual sh-t product: a $100,000 toilet, equipped with toilet paper, plunger and free shipping. "Interested in buying sh-t product? You've come to the right place! Here at Zappos.com, we happily sell sh-t products to everybody! This is the throne, everyone has been watching," the site states, with the last sentence referring to Kanye's album collaboration with Jay Z. "Whether you're #1 or #2, your clique will show no mercy, even in Paris." "I got into this giant argument with the head of Zappos that he's trying to tell me what I need to focus on," West said. "Meanwhile, he sells all this sh-t product to everybody, his whole thing is based off of selling sh-t product." If I had to judge, I'd say Zappos got the win. Not only was their approach humorous, but it was also marketing genius. What could have been a PR nightmare – a mudslinging fight on social media between Zappos CEO Tony Hsieh and Kanye West -- turned into a great opportunity for Zappos to not only increase brand awareness but provided a viral hit, one that had the ecommerce site coming out as the champion. The company didn't stop there with its tongue-in-cheek response. Zappos allowed for customers to post actual comments of the fictitious product. With 125 comments and counting, here are the top 10. 10. Wow what a great sh-t product. This is by far the best sh-t product I ever bought! Thanks Zappos, as always! A+ Now I can feel like Kanye as the king of my throne! 9. Best stocking stuffer ever for the Maybach set! Only complaint is that Kanye's clothing line and lame rhymes plugged my product up. Works great otherwise. 8. "This is so funny I actually put it in my cart and bought it, VIP Express. Wonder what Zappos and VISA will do with that??!! No I don't have $100k available on my credit card but hey Zappos has free returns for 365 days! Let's see if anyone ships me anything. HAHAHAHAHAHA Zappos I love you guys! Loyal customer for years now. :)"
7. "Nice try, Zappos. But I have to give this one to Kanye. I think he knows a lot more about sh-t products than you. Who else can still rock ripped jeans circa 1995? And the gray flannel pullover shirt, the fleece hoodies, the tie-dye tees, the Confederate-flag-emblazoned bomber jacket -- I could go on. Tell me that's not fashion-forward! Please keep watching the throne so you can learn how a REAL fashionisto does it." 6. "This S**T is hotter than leather jogging pants!" 5. 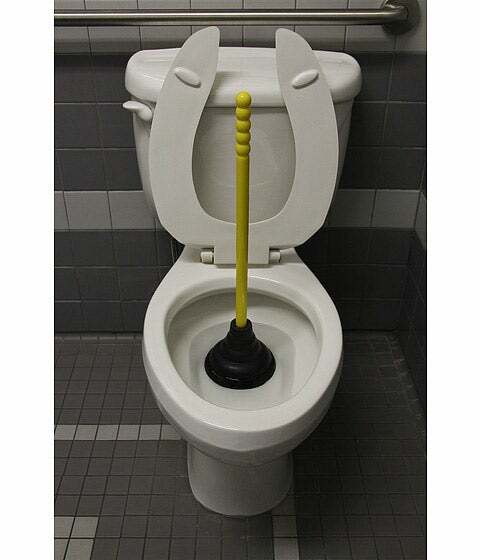 "Lift the plunger to see Kanye's career, and musical talent." 4. "This item has more class and style and intelligence than anything Kanye West ever made. Cheers to Tony Hsieh, the man who single handedly turned around downtown Las Vegas." 3. "Finally those Kanye West CDs will go down when I flush them! Thanks Zappos! This product is a winner!" 2. "Absolutely love this product! Similar to Kanye West's career, it seems to go down the toilet flawlessly. Unlike Kanye, this product lets me finish and wipe." 1. "Yo Zappos! Imma let you finish . . . but this is the best Sh-t product of all time!" -November 21, 2013 by K.W. If you had a chance to review this product, what would you say? Let us know in the comments below.